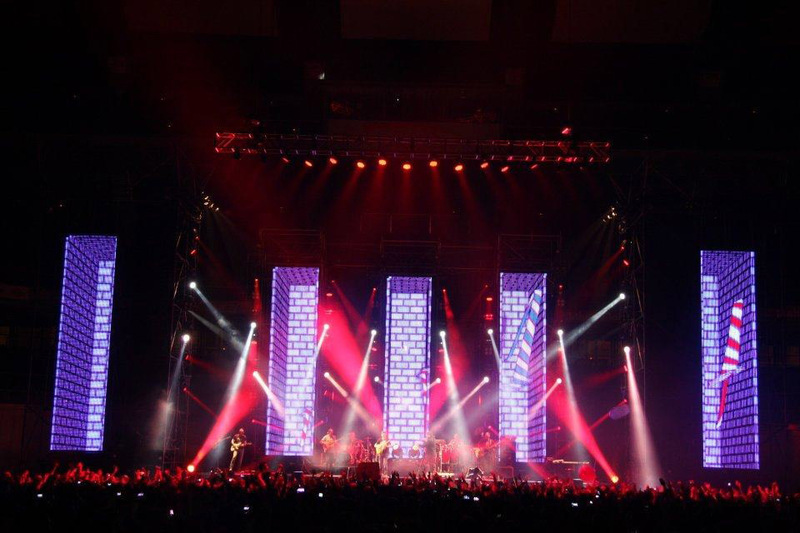 Juanjo Beloqui, stage and lighting designer for Spanish band Estopa, created five towering LED screens using Martin LC Plus Series™ LED video panels for the duo’s latest tour across Spain. “The Martin LC screen performed superbly as a 40 mm LED curtain and gave a fantastic image quality for the application I used them for,” Juanjo stated of the panels, which offer key advantages over other types of LED panels like greater brightness and better color and brightness uniformity. “They were also very easy to set up and at only 11 kg per square meter were the perfect weight,” he adds of the easy-to-assemble panels, an important factor when constructing five large towers at each tour stop. Following the success of their last album “Estopa 2.0,” the brother duo toured across Spain with 40 of the LC Plus panels and interspersed them with 10 Atomic 3000™ strobes with Atomic Colors™ scrollers. Juanjo, who has collaborated on projects with some of the lighting industry’s top designers like Jose Luis Alegre, Patrick Woodroffe and Eneas Macintosh, also programmed the lighting and video for the Estopa tour and along with Felipe Ramos was responsible for creation of the video content. “Each song has its own message and there are some songs that allow me to use some fun textures like bionic girls dancing or singers in a Manga format flying over the duo’s home city of Cornellà. In other more conceptual songs I use imagery like big glasses in a virtual living room, or the world coming out of a drawer and falling to the floor. Those all looked great on the LC panels.” Juanjo says. Electric Cube and ASL Light Solutions supplied the LC panels for the tour with ASL also supplying the Atomic 3000s.